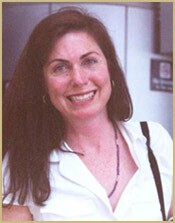 Meg Davis was born in Denver Colorado in 1962. She is a talented daughter of two colorful Houston families who enlivened the city and several foreign Countries for generations. The artist's ancestry and artistic lineage stem directly from travel and adventure. Meg found herself being drawn to a life surrounded by art and was extensively inspired by her differing environments. From Calgary Alberta, Canada to mountains of San Miguel De Allende. She continued to travel widely and found a endless stream of inspiration in all her surroundings. She loves children and story telling and a pictorial story is in each painting to enliven the hearts of all who view her work. Meg in front of one of her paintings. 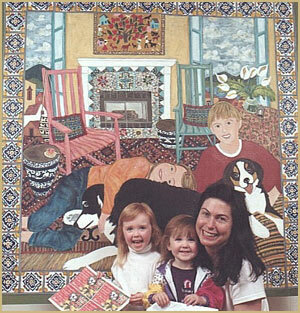 This painting was commissioned by a family in Austin, Texas. They sent pictures of their children, pets, and treasured belongings by mail, then they determined the size of the painting. The family gave the creative freedom and composition to be determined by me. When the project was finished they loved it and we had a lot of fun. In her paintings Meg Davis is recognized for her ability to capture a spiritual essence of her subjects and the aptitude for dynamic color. The artist has created a collection of art that transports one to a world of enchantment. Her love of color and pattern echo a mood for quiet luxury. Meg lives in San Miguel de Allende, Mexico and resides in Johnson City, Texas in the Hill Country at different times of the year. After graduating from Southwest Texas State University in 1988 with a BA in fine arts; Meg was invited to exhibit at the Houston Museum of Fine Arts "First Choice" exhibit in November 1989. This was the start of a promising career in painting. Meg has had countless person shows and has continued to support herself solely on her paintings since that time. She regularly exhibits her work in galleries in Santa Fe, Taos, Kansas City, San Antonio, Houston, Austin, and Mexico. Currently her paintings are proudly on exhibit in Boerne, Texas at Gallery "Hay Day"!